If you purchased qualifying property by December 31, 2017, you may be able to take advantage of Section 179 expensing on your 2017 tax return. You’ll also want to keep this tax break in mind in your property purchase planning, because the Tax Cuts and Jobs Act (TCJA), signed into law this past December, significantly enhances it beginning in 2018. Sec. 179 expensing allows eligible taxpayers to deduct the entire cost of qualifying new or used depreciable property and most software in Year 1, subject to various limitations. For tax years that began in 2017, the maximum Sec. 179 deduction is $510,000. The maximum deduction is phased out dollar for dollar to the extent the cost of eligible property placed in service during the tax year exceeds the phaseout threshold of $2.03 million. Certain improvements to the interiors of retail buildings. Deductions claimed for qualified real property costs count against the overall maximum for Sec. 179 expensing. The TCJA permanently enhances Sec. 179 expensing. Under the new law, for qualifying property placed in service in tax years beginning in 2018, the maximum Sec. 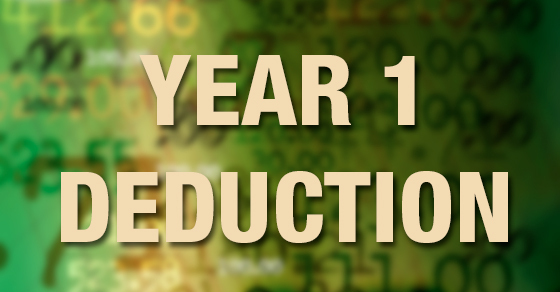 179 deduction is increased to $1 million, and the phaseout threshold is increased to $2.5 million. For later tax years, these amounts will be indexed for inflation. For purposes of determining eligibility for these higher limits, property is treated as acquired on the date on which a written binding contract for the acquisition is signed. The new law also expands the definition of eligible property to include certain depreciable tangible personal property used predominantly to furnish lodging. The definition of qualified real property eligible for Sec. 179 expensing is also expanded to include the following improvements to nonresidential real property: roofs, HVAC equipment, fire protection and alarm systems, and security systems. Many rules apply, so please contact us to learn if you qualify for this break on your 2017 return. We’d also be happy to discuss your future purchasing plans so you can reap the maximum benefits from enhanced Sec. 179 expensing and other tax law changes under the TCJA. Security Question: What is 4+6?